Landing: March 8 @ approx. 11:30 a.m. Flight Day 6 is drawing to a close. The astronauts are finishing a day devoted to installing and activating the Permanent Multipurpose Module. Wakeup time tomorrow will be 5:23 a.m. EST for the mission's second of two planned spacewalks. The addition of this module gives the International Space Station an additional 2,472 cubic feet of pressurized volume. PMM OPENED. The astronauts just opened the hatchway and entered into the Permanent Multipurpose Module at 6:17 p.m. EST. The International Space Station's newest room is open for business. A review of the procedures planned during the mission's second spacewalk is occurring right now aboard the space station for the Discovery and Expedition 26 crews. Steve Bowen and Al Drew will venture outside the complex around 10:15 a.m. EST to perform a wide variety of maintenance work around the station. Work in the vestibule between the Permanent Multipurpose Module and the Unity node is continuing. The crew plans to open the hatches and enter the cargo module this evening. Check out Spaceflight Now's Facebook page! "These MPLMs were only going to be in space for weeks at a time and you won't worry about things like meteorites or debris hitting it and knocking holes in it and so, in this case, we need to outfit it with micrometeorite debris shielding much like you see on the Columbus laboratory which is about the same dimensions as this, as this PMM that we're going to dock. "People will be in there so you'll want to have things like communications in there, the ability to have fire alarms ring inside and things of that nature. I mean, it's a closet but if you're going to be in there you need to be able to make it a habitable place and so they've been doing modifications to it to make it a more permanent structure rather than this temporary addition to the space station that comes up and leaves with the shuttle." Russian mission managers Tuesday rejected a NASA proposal to undock a three-man Soyuz spacecraft for a fly around of the International Space Station to capture unprecedented views of the complex with the shuttle Discovery and a full complement of European, Japanese and Russian spacecraft attached. It is going to take several hours for the astronauts to conduct checks and outfit the small passageway between Unity and the Permanent Multipurpose Module. Opening of the hatch and the crew entering into the module is targeted for approximately 7 p.m. EST, but that time could change. NO GO FOR FLYABOUT. The mission managers met this morning and formally decided against performing the Soyuz spacecraft "flyabout" of the International Space Station. The proposal had been examined for a few weeks to photograph the space shuttle and station docked together with the visiting European, Japanese and Russian vehicles. But the plan has been rejected for Discovery's flight. The station's robot arm has released its grip on Permanent Multipurpose Module and is backing away. An Italian-made module that will give the International Space Station a float-in closet and help ease the outpost's storage woes has been successfully mounted to the nadir berthing port of the Unity connecting node. Attachment was called complete at 10:05 a.m. EST as the orbiting complex flew 220 miles over the Sahara. The Permanent Multipurpose Module already visited the station seven times as the "Leonardo" reusable cargo hauler. But since its most recent flight last April, ground crews have modified and armored the cylindrical vessel for its new role as a long-term fixture in orbit. Originally constructed make roundtrips aboard shuttle missions to ferry supplies to the station and return items to Earth, project officials decided to launch the module one more time and then leave it attached to the complex as a valuable additional room. "It's like that extra garage bay or that extra closet in the house that you always wished you had. It's just a place to park things so they're not cluttering your workspace," said Scott Higginbotham, KSC's STS-133 payload mission manager. Known by its original nickname Leonardo, or more formally as the Permanent Multipurpose Module, this cylindrical structure is packed with new equipment, spare parts, provisions for the station and Robonaut 2. The module is 21 feet long, 15 feet wide and weighed 14 tons at launch. The first stage capture has occurred. The arm will be limped for the next stage of bolt turning. The station arm will hold PMM while electrically-driven bolts tighten to firmly connect the cargo-delivery module to the space station. Initial capturing of the module in the berthing mechanism is beginning by station resident Cady Coleman and Discovery pilot Eric Boe. With PMM seated into the docking port, four ready-to-latch indications have triggered. Two of the four latch indicators have fired. The arm operators are going to input a little negative-pitch motion to get the other two. Just 20 centimeters left to go, Mission Control says. PMM is inching forward again, moving closer to Unity as the space station flies in orbital daylight that's offering brilliant video views of this construction effort. The "go" was just give to push onward to the ready-to-latch position. Mike Barratt and Nicole Stott, controlling the robot arm from the workstation inside the Cupola, are getting PMM lined up with the Unity port. "The PMM started off its life as an MPLM, a Multipurpose Logistics Module that we're simply going to attach permanently to the space station. If people aren't familiar with the Multipurpose Logistics Module, if you've ever seen those pods containers that the people come and drop off in your driveway to give you extra storage, that's what it is. It's a big Conex for storing things. So we bring up big loads of transfer and we unload that thing and we load it back up with things that need to come back to Earth and we take those things home. "Well, this time we're not bringing it back home. The space station needs some place to store all this stuff. Anybody's who got a house similar to, the junk piles up and you need some place to store it. Well, we don't have a closet or a big closet except above the Japanese Experiment Module. There's a small one up there. We needed something bigger and that's the point is we're taking one of these pods containers and we're permanently attaching it to the space station." The robot arm is beginning a long sequence of moves to maneuver PMM from just above Discovery's bay to the preinstall position beneath the Unity docking port. "Well, the PMM will be a little simpler than the ELC4 because we're using only one arm to do it but it, by its sheer size, will be quite an amazing thing to see. We have a lot of experience taking the MPLMs out of our shuttle payload bay and docking those to station and obviously this is a one way trip. We're going to take it out and attach it to Node 1, almost in the center of the stack and, of course, we'll leave it there. "We'll make sure that the shuttle guys undo the latches and unlock it so that it's free floating and we'll take it out and back it off from the shuttle payload bay and then we will fly it quite a distance actually from the very front of the station to the middle of the stack and attach it to Node 1. "Now a couple of differences are that when I was there last there was no Cupola, which is a big domed wonderfully windowed extension on Node 3. We actually have a robotics work station there, so aside from our camera views, we're going to have this magnificent view of the PMM coming out of the shuttle payload bay and we're actually docking it almost right next to us on Node 1 so we'll have that view and I think it's going to be wonderful." The Canadian-built arm has hoisted the Italian module cleanly out of the shuttle's payload bay for today's attachment to the nadir port of the station's Unity connecting node. Permanent Multipurpose Module is in motion! The module is slowly rising out of the shuttle bay toward its new home on the International Space Station. And now with the payload retention latch assemblies in Discovery now open, the space station robotic arm operators have been given a "go" by shuttle commander Steve Lindsey to begin the PMM unberthing. The remotely controlled power umbilical between the shuttle and Permanent Multipurpose Module has been disengaged. This essentially unplugs the module from Discovery. The International Space Station's robot arm reached down into Discovery's payload bay and grappled the Permanent Multipurpose Module. A final module will be attached to the International Space Station Tuesday, an upgraded supply transfer compartment that will serve as a permanent storage closet to give station crews more room. The Italian-built Permanent Multipurpose Module, or PMM, will be pulled from the shuttle Discovery's cargo bay starting around 8:45 a.m. EST (GMT-5). Astronauts Nicole Stott and MIchael Barratt, operating the space station's robot arm, will maneuver the module into position for attachment to the Earth-facing port of the central Unity module. Once in place, four latches will engage to pull the module snugly into place. Sixteen motorized bolts then will drive to firmly lock it to the station. 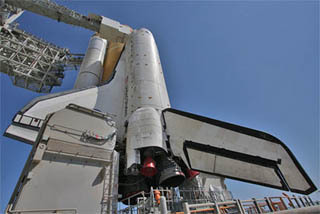 Overnight, flight controllers tested the common berthing mechanism to make sure the big bolts are ready for operation. The latest version of the NASA Television schedule (Rev. E) can be downloaded here. Mission Control just awakened the astronauts to start Flight Day 6 and the workday that will see the Permanent Multipurpose Module attached as the International Space Station's newest room.